All reservations must be made by March 7 to qualify for the discounted room rate of $184 single or double occupancy per night plus 6 percent sales tax and 9.5 percent occupancy tax (based upon availability). Reservations made after this date are accepted on a space and rate available basis only. Each reservation must be guaranteed with first night's room and tax by cash or credit card, and deposits will be charged immediately. Phone: 1-800-HILTONS (445-8667) and mention the group code NAA to get the special discounted rate. 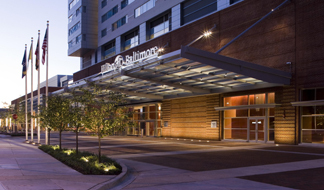 The Hilton Baltimore Inner Harbor offers valet parking for guests and visitors.